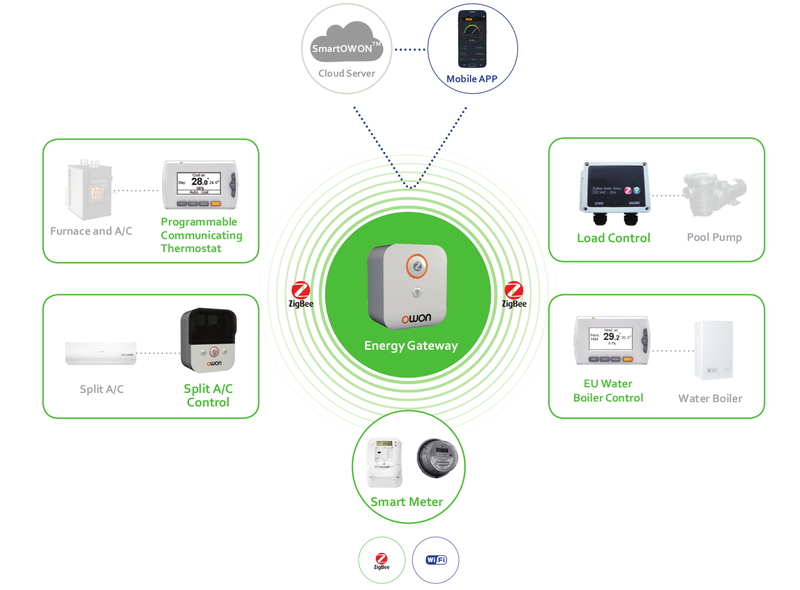 OWON Demand Response Management system consists of an Energy Gateway and a number of surrounding DR components such as US standard Programmable Communicating Thermostat, European standard Heating Unit, Split A/C control and Load Control Switch. The Energy Gateway and the DR devices are all equipped with ZigBee SEP1.1x protocol and will be able to join the same Home Area Network coordinated by a SEP1.x Smart Meter. Such system topology allows both utility and household to control and manage the demand response programs, which unlocks more value so that customers better benefit from the smart grid deployment. At the Utility side, the DR command from the back office will be delivered to a specific device through a Smart Meter. While at the end users side, the Energy Gateway not only interacts with the DR components given its ZigBee connectivity; but also connects to the end user’s mobile devices either directly or via a cloud server using its WiFi connectivity. This allows the end users to access to their Home Energy Management either locally or from distance, so as to actively involve in the Demand Response Program.